If you have ever questioned the official narrative for the September 11th attacks then you have, without a doubt, been dubbed a conspiracy nut by the establishment media and those who hang on their every word. Like the Warren Commission report on the JFK assassination, the 9/11 Report assembled by a Congressional investigation is unraveling and being revealed for what it really is – nothing more than a cover story. This is no longer a conspiracy theory… it’s conspiracy fact. After the 9/11 attacks, the public was told al Qaeda acted alone, with no state sponsors. But the White House never let it see an entire section of Congress’ investigative report on 9/11 dealing with “specific sources of foreign support” for the 19 hijackers, 15 of whom were Saudi nationals. It was kept secret and remains so today. A pair of lawmakers who recently read the redacted portion say they are “absolutely shocked” at the level of foreign state involvement in the attacks. Some information already has leaked from the classified section, which is based on both CIA and FBI documents, and it points back to Saudi Arabia, a presumed ally. The Saudis deny any role in 9/11, but the CIA in one memo reportedly found “incontrovertible evidence” that Saudi government officials — not just wealthy Saudi hardliners, but high-level diplomats and intelligence officers employed by the kingdom — helped the hijackers both financially and logistically. The intelligence files cited in the report directly implicate the Saudi embassy in Washington and consulate in Los Angeles in the attacks, making 9/11 not just an act of terrorism, but an act of war. 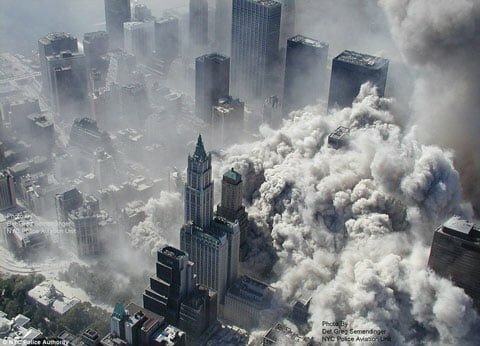 The New York Post investigation reveals that Saudi agents, officials and operatives in Virginia, Florida, California and D.C. provided direct support by way funding or intelligence to those involved in bringing down the towers. It’s obvious given what happened, the logistical and funding requirements and where the hijackers came from along with inexplicable actions immediately following the attacks – unless our government explicitly let certain people flee. Yet we went to war in Iraq and Afghanistan while helping the Saudis — the very people who attacked us. And Obama, to this day, kisses the Saudi King. It makes a very convincing case that the Saudi Government was involved in an act of war against the United States. Not simply terrorism — remember, the Pentagon, a military target, was one of the locations hit. The other intended target for the plane that went down in PA was the Capitol. You damn well should be. It’s about damn time that the mainstream media started talking about this — you’re only a decade late, *******s. And no, people like myself who have been saying this all along are not nuts. In addition to this startling, yet unsurprising, revelation is even more evidence that those within the Saudi government knew what was coming. Somebody made a ton of money shorting airline stocks by positioning themselves for stock prices to crash in the aftermath of 9/11 and according to Infowars, that may well have been the Chief of Saudi Intelligence and other government officials. Moreover, after all flights within the continental United States were grounded there was one – just one – airplane that was allowed to fly over U.S. soil to, you guessed it, Saudi Arabia. On board that plane were – and this has been confirmed by an official Freedom of Information request – the members of Osama Bin Laden’s extended family. And these are but a few of the hundreds of inconsistencies surrounding the September 11th, 2001 attacks. They’ve spent hundreds of billions of dollars on securing the United States and preventing another act of terror on U.S. soil. They’ve turned their massive surveillance infrastructure inwards on the American people under the pretext of preserving our safety. They’ve identified hundreds of thousands of Americans and included them on watch lists that restrict their travel or flag them as potential threats to national security. Yet the real threat, the one that has been validated by scores of reports and investigations, is being redacted and ignored by our government. We know that there is more to 9/11 than the official story. It doesn’t just involve the Saudis. America’s air defense, for example, were seeminglydisarmed minutes before the attack occurred. Moreover, intelligence agents from Israel were reportedly spotted in New York on the day of, arrested by NYPD, and then released under suspicious circumstances. All of this is highly suspect, especially that a mainstream news source like the New York Post would start releasing these details to the general public. As with 9/11, most people couldn’t make sense of it or why. A decade on we have a better perspective because we’ve seen the implementation of initiatives all across America as a result of what happened that day. Call it a conspiracy, call it whatever you like, but look around. If they lied – yes, lied – about the assassination of a President of the United States, or about Benghazi, or Fast and Furious, or the benefits of new health care laws, then what else are they hiding from us? How much do you trust your government? How much do you trust the official narrative peddled by the establishment? How much do you trust that the powers that be have our best interests at heart?